Leave from Exit 1. At the top of the stairs turn left and walk up Glasshouse Street with Whole Foods on your right. Turn right on Air Street, cross over Brewer Street and into Golden Square. Number 23 is on the left. Leave from Exit 8. Turn left at the top of the stairs and walk down Argyll Street towards Liberty. Cross Great Marlborough Street at the zebra crossing and take the first right into Carnaby Street. 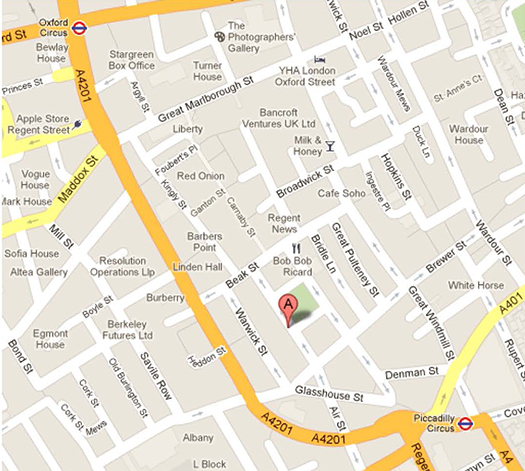 At the end, turn right into Beak Street and then first left into Upper John Street which leads into Golden Square. Number 23 is on the right.